Just a few days ago, on Wednesday November 7th, the shooting at the Borderline Bar and Grill occurred, and there were a number of Pepperdine students there. While all were severely traumatized, one precious first-year student, Alaina Housley, was killed. As many other campuses, schools, faith and social communities know all too well, the ripple effects of such violence reach far into a community. Thursday, we gathered for what was to be an initial prayer service on campus where pain, sadness, and anger were palpable. The grieving process for our campus community, not to mention that of other communities, will be slow and long. I can only imagine what it will be for the affected families. What can we do but hold each other and start to lift our feeble voices in prayer? But then, as we came out of that prayer service, our phones started buzzing: A wildfire was starting to threaten some nearby communities. A few hours later, in the early morning hours of Friday, November 9, those alerts had turned into an emergency. With the Santa Ana winds surging, the Woolsey fire was threatening the entire region. By midday on Friday, the nearly 4,000 residents on campus had two choices: Evacuate with many Malibu residents, or relocate to the safe zones of lower campus in accordance with longstanding protocol developed with the LA County Fire Department. While many left campus, my family chose to stay in part because of the challenges being experienced on the evacuation roads, the safety of our lower campus, and to be a part of the support staff for the students who stayed. 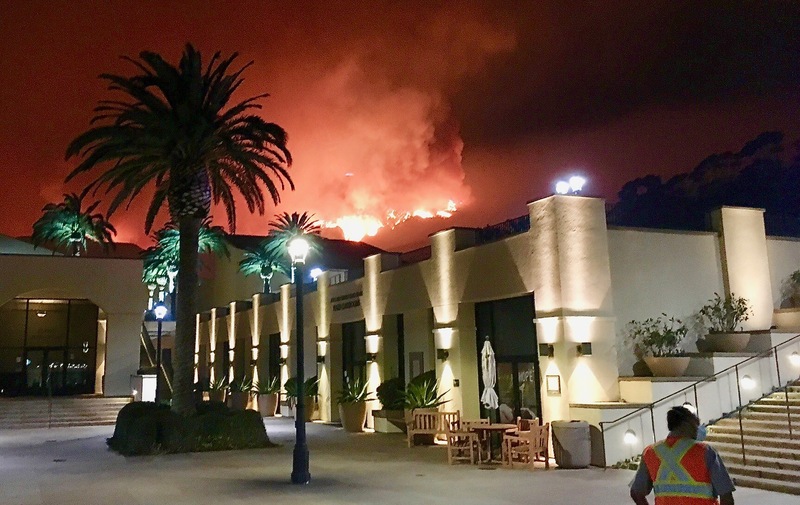 At about 11:00 pm, we watched as the fire poured over the hills above campus, lighting up in the night sky, raging around our perimeter, and threatening structures on the upper campus including our faculty housing. Despite some misinformed reporting that went viral, nearly 1,000 people stayed the night safely in the university cafeteria and library, and the campus itself was spared any significant structural damage. That does not, however, remove the experience of threat and trauma. 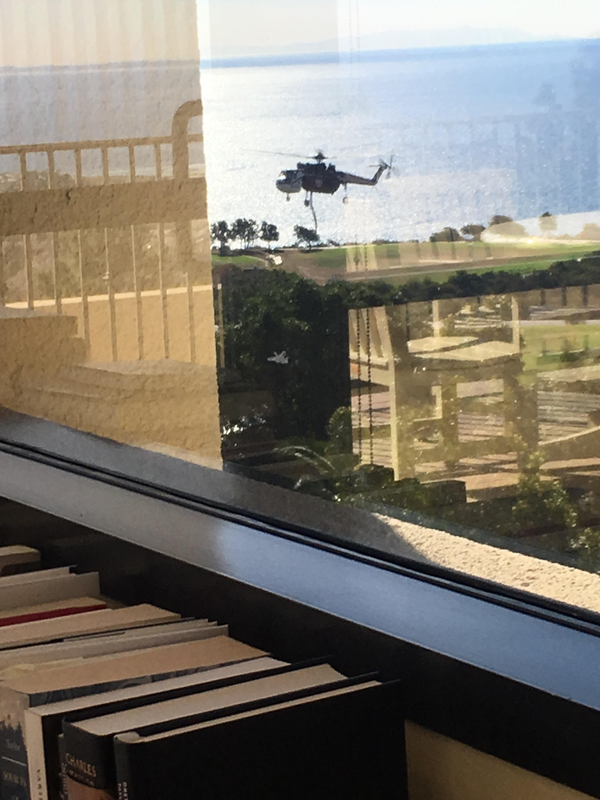 Now, five days later, as I type these words from my office on campus, I am watching a hovering helicopter scoop water from one of our campus reservoirs to use in the continuing air attack on the Woolsey fire which continues to burn in a nearby canyon. Pepperdine is one of the staging areas for the heroic efforts of the various response teams that continue to work around the clock. While our campus is no longer directly threatened and fire containment is increasing, the fire has burned nearly 100,000 acres and impacted many lives and destroyed much property. Many Pepperdine students, faculty, and staff who live off-campus have lost homes and apartments. What does this have to do with our vocational discussions? Pepperdine is usually a quiet and secure space for young people to contemplate and explore life’s meaning and their own sense of purpose and calling. This week, it feels very different. We often imagine vocational discussions and processes happening in secured offices and classrooms. This week, we are reminded that vocational discernment must also grapple with contexts that are fragile, unpredictable, and insecure. It reminds us that vocation is less about easy optimism and more about service, love, and the search for hope in the midst of challenges and unanswered questions. I now imagine some of the vocational discussions that I will have with students in the coming weeks and months. How will we mourn the loss of a member of our community and process the trauma of societal and natural threats, while remaining open and hopeful in our dreams and callings? Will some students come through the literal and figurative smoke of these experiences with new clarity for how they can be a part of solutions? Will some of the undergraduates that will return to our campus in a few weeks someday help us better address the challenges of gun violence and mental illness? Will others develop even better technologies and procedures for emergency relief? Will some help us understand better current ecological crises and their many implications? Will others, as teachers, nurses, doctors, pastors, lawyers, and entrepreneurs, plant seeds of peace that will serve and bless countless individuals and communities? I have no doubt that will happen, and all the more as we, educators and mentors, guide and love them through these challenging stages of the journey. It may be too soon for those in my community to reflect on this thoroughly. There is still smoke in the air. There are still tears to be shed. The clapping of another helicopter is shaking my office window. And yet, vocational discernment continues during such times, often with more clarity and urgency. Thanks, John, for your very thoughtful post about the recent traumas faced by the Pepperdine community. I just returned from a meeting of Christian university presidents at which President Benton would have been present if not for the need to remain on your campus to help with the current needs. Please share with the Pepperdine community that, here at Harding, you all are remembered tenderly and prayed for regularly as you navigate these challenges. Blessings!